Located in the Genesee Valley and Finger Lakes areas of upstate New York, the greater Rochester community is rich in natural and human resources. Our legacy is one of social progress as illustrated by the struggles against slavery and for the rights of women. Our economic history has largely been one of innovation and prosperity. Today, we face a great transition as manufacturing gives way to a less certain and more diverse economy. As this transition creates economic challenges, we are also faced with the test of providing for the physical and social well-being of our diverse community. 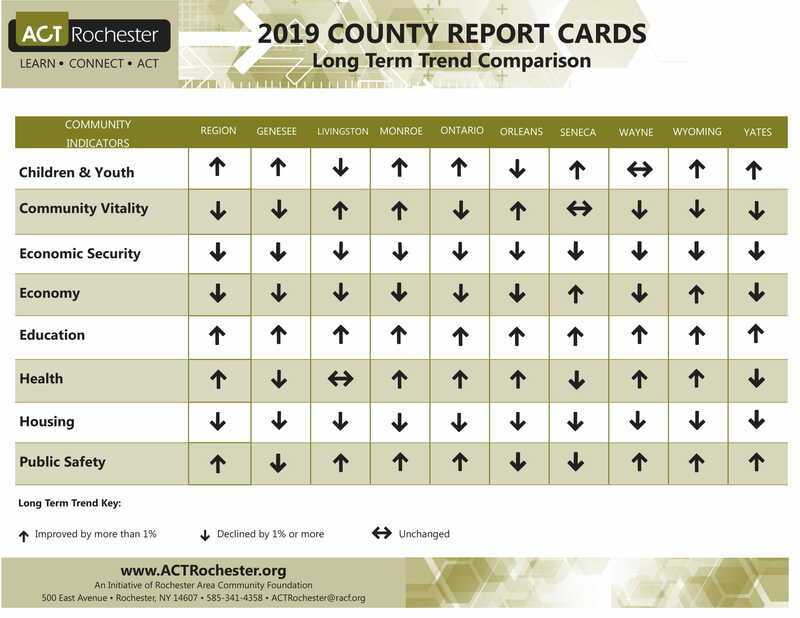 The Genesee County Report Card aggregates data from more than 100 community indicators on the site and use symbols, colors and arrows to provide a quick, at-a-glance overview of the well-being of the county. This data covers each of ACT Rochester's nine topic groups. Click on the picture below for the full report. More than 1.5 million people live in the nine counties that make up this region (Genesee, Livingston, Monroe, Ontario, Orleans, Seneca, Wayne, Wyoming, and Yates). Each County has a Report Card and Summary available. These summaries include general demographic information and trends as well as an assessment of the county's status in those topic areas where meaningful county-level information is available. 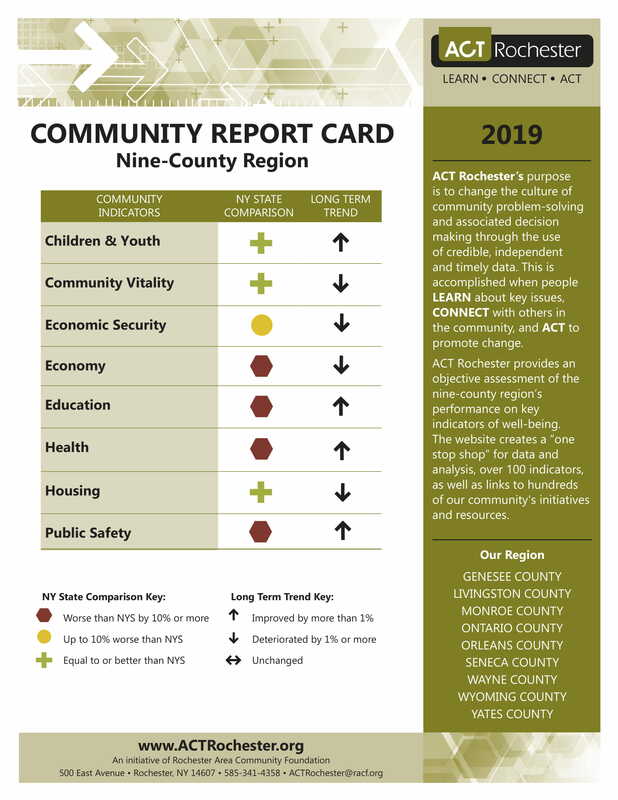 The Nine-County Regional Report Card aggregates data from more than 100 community indicators on the site and use symbols, colors and arrows to provide a quick, at-a-glance overview of the well-being of the county. This data covers each of ACT Rochester's nine topic groups. Click on the picture below for the full report. 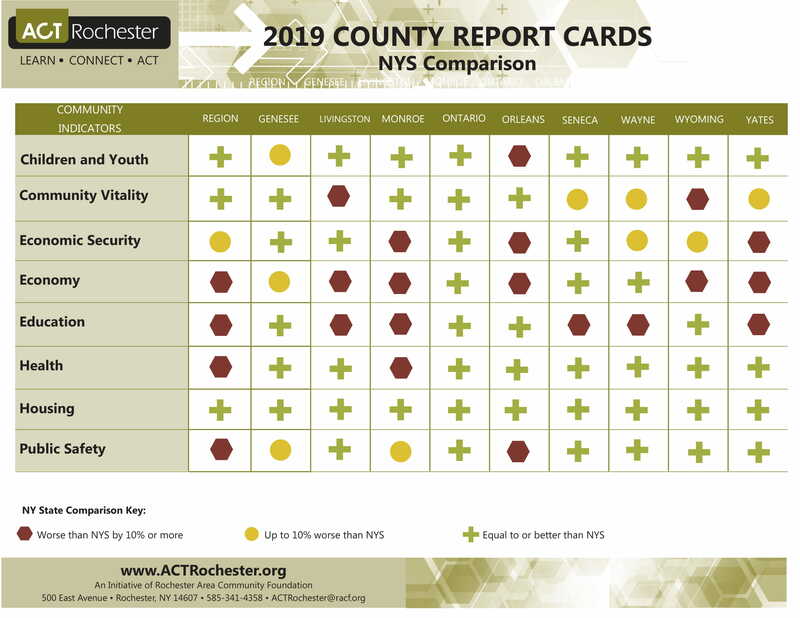 The County Report Cards aggregate data from more than 100 community indicators on the site and use symbols, colors and arrows to provide a quick, at-a-glance overview of the well-being of the county. This data cover the topics of Children and Youth, Community Vitality, Economic Security, Economy, Education, Health, Housing, and Public Safety. Click the images below for a comparison of all of the county report card results. 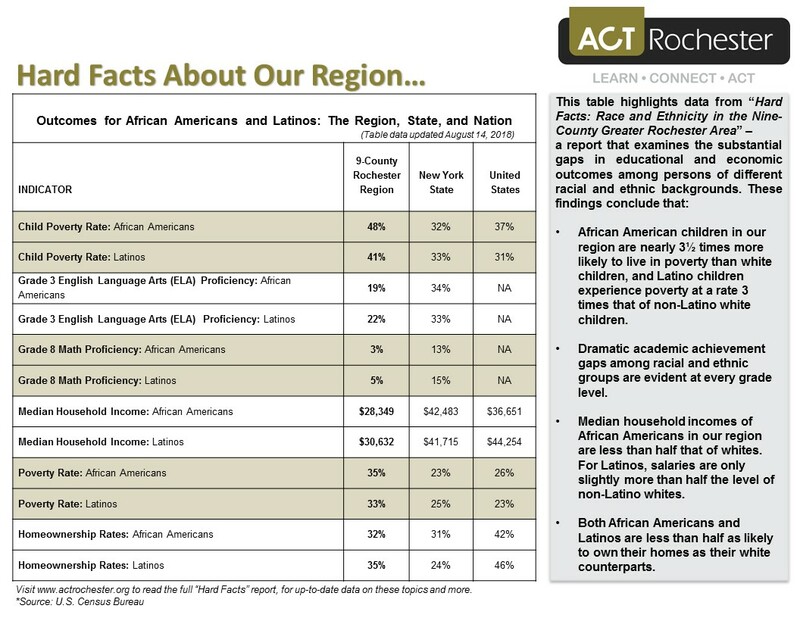 The table below highlights data from “Hard Facts: Race and Ethnicity in the Nine-County Greater Rochester Area” – ACT Rochester's 2017 Race Report that examines the substantial gaps in educational and economic outcomes among persons of different racial and ethnic backgrounds. Access the "Hard Facts" summary table for any specific Finger Lakes county by clicking on that county's name (to the left of screen).